Horse Powered Learning is an innovative, hands-on educational program for Pre-K to 8th grade students. Pre-K to 8th grade student groups travel to CTR’s farm to engage in 90 minutes of experiential learning activities with horses. My daughter came home and picked up a book on her own for the very first time! [HPL] was all my daughter talked about at the dinner table. What a wonderful way to build vocabulary! My son came home talking about the lead rope, obstacles, road blocks, team work and really knew what they meant. This was a fantastic experience. All lessons are facilitated by a teacher certified in the state of Maryland. Horses are highly intelligent and they provide an active, sensory experience so concepts “stick” in new ways for students. There is no riding involved. 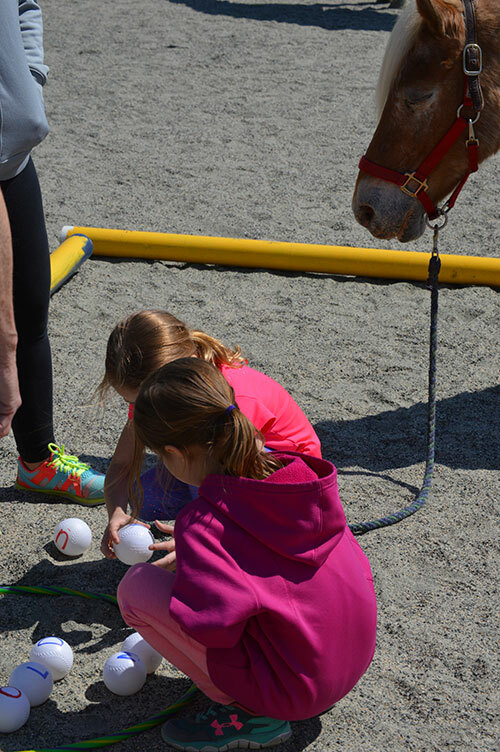 Safety is always a focus at CTR, so students are supervised by the Horse Powered Learning Program Manager, an Equine Specialist, and CTR’s trained volunteers. Each subject can be tailored to group learning needs/goals. The ultimate goal of this program is to help students at all levels become more intrinsically motivated learners. The cost is determined based on the number of students in each group. How do I learn more or schedule an experience? Please contact our Program Manager, Gayle Zorbach, at (443) 528-7793 or info@ctrchanginglives.org.